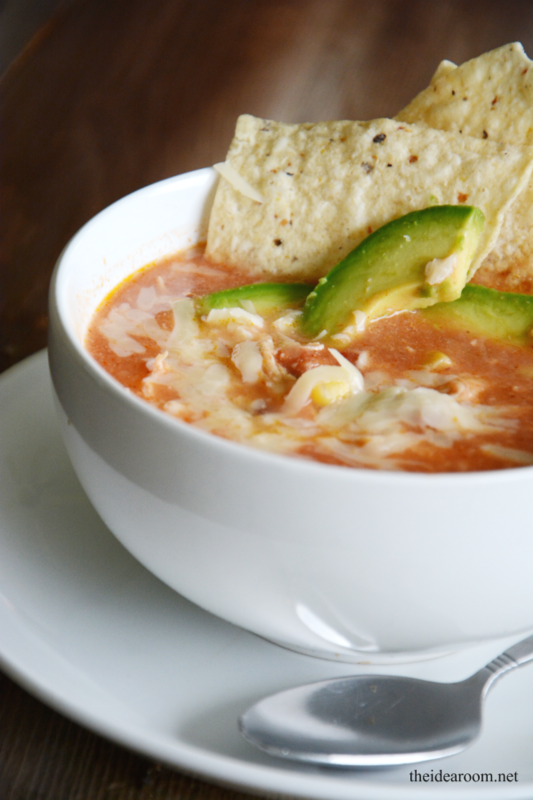 Nothing is better than a warm bowl of Chicken Tortilla Soup on a cold day! 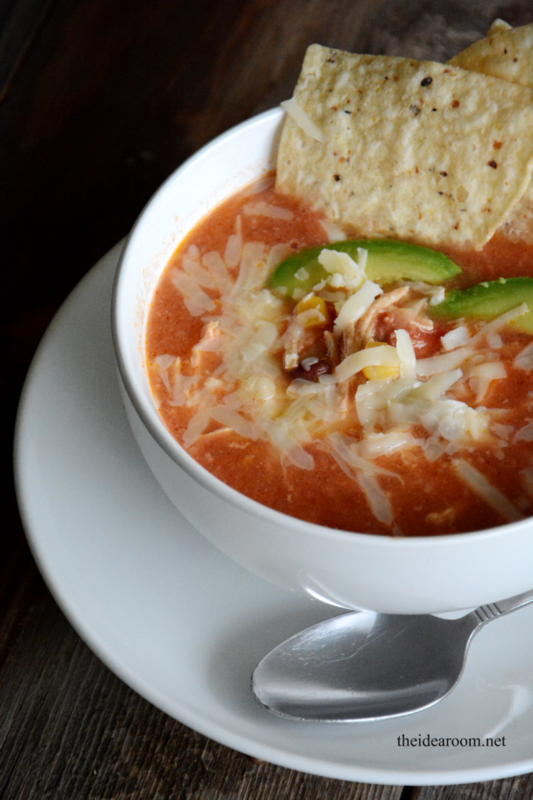 This Slow Cooker Chicken Tortilla Soup is delicious and easy to make. Add it to your menu for an easy dinner recipe. 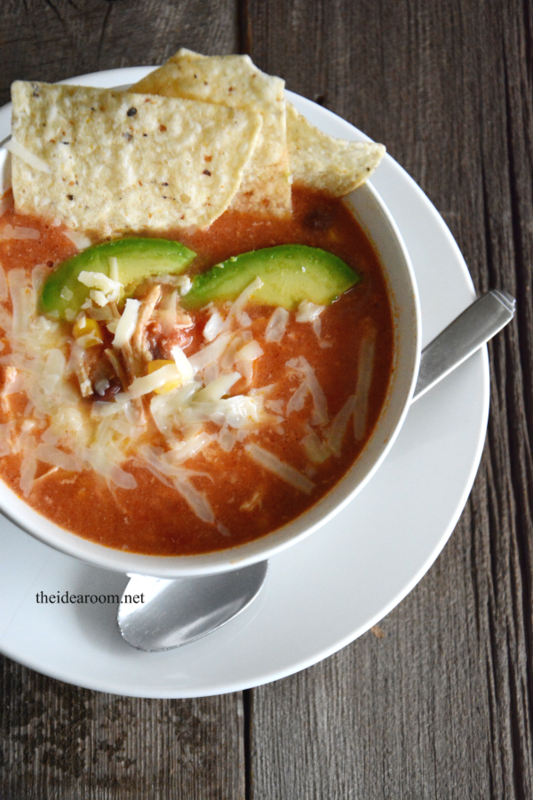 The other day we had a our first real snow storm of the season and it was the perfect day to make one of our favorite Crock Pot Dinners…Crock Pot Chicken Tortilla Soup. This soup is one of the family’s favorite! This crock pot soup takes a little bit more effort than just dumping things into the crock pot, but it is totally worth it. And if you do it early in the day when the kids are at school or just before work, you don’t have to deal with the crazy dinner rush. You will actually make a roux first and then use that as your soup base. It makes it super yummy though and is really pretty easy. I have step by step instructions below. If you have never made a roux, you totally can. It is really pretty simple and nothing to be afraid of…like I was the first time I made one several years ago! I think you are really going to love this recipe! 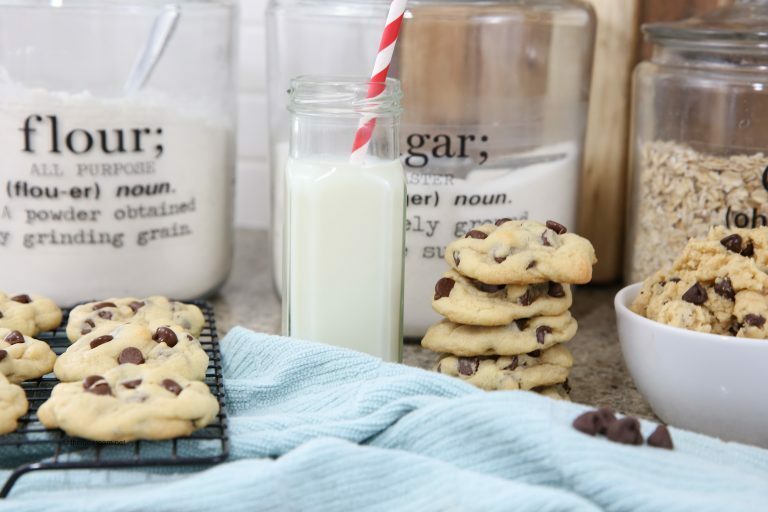 Whenever I make this, it is fun to see the kids get home from school and head over to the crock pot with excitement about what’s brewing away in there. I love that we can do the mad dash after school with the sports practices and homework and still find the time to sit down together and enjoy and delicious meal together around the dinner table! This Chicken Tortilla Soup Recipe is a yummy, easy weeknight dinner perfect for feeding your busy family. An easy Slow Cooker Soup Recipe that will become a family favorite! Stir in flour and keep stirring until smooth and bubbly. Watch this closely as it can scorch or clump easily. Remove mixture from heat and add the chicken broth and ½ cup of the milk, a little at a time, stirring continuously to keep smooth. Return to heat and bring sauce to an easy boil while stirring constantly, until it thickens and remove from heat. In a large bowl, whisk together the enchilada sauce and chicken broth mixture . Gradually whisk in remaining milk until smooth and then set aside. In a crockpot, combine drained and rinsed beans, tomatoes, corn, onion, and salt. Place the chicken breasts on top of the mixture. Pour sauce mixture over ingredients in cooker. Cover and then cook on low heat for 6 to 8 hours or on high for 3 to 4 hours. About a half an hour or so before serving (or when you can and the chicken is cooked fully), remove chicken and shred it into bite-sized pieces. Add chicken back into the soup, mix together. If you want to make your own Enchilada Sauce (which I usually do unless I am pressed for time), you can use this yummy recipe. This is also a great recipe to use for making Enchiladas! Easy Red Enchilada Sauce. It only takes 10 minutes to make this super easy red enchilada sauce that is bursting with flavor. Never buy the canned stuff again! Gradually stir in tomato sauce, water, cumin, garlic powder, and onion salt into the flour and chili powder until smooth, and continue cooking over medium heat approximately 10 minutes, or until thickened slightly. Serve immediately or store in airtight container for up to a week in the fridge. 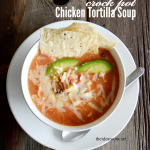 I love Chicken Tortilla Soup and I love anything in a crockpot. So this is perfection in my eyes! Thank you for sharing. So excited for “soup season”! Yay!! We love soup too!! It is true!! Crock pots are life savers aren’t they? Looks yummy! We love crock pot soup recipes! I can’t wait to to make the crockpot chicken tortllla soup..If you’d like to add a little smoky flavor to it, you can toast (on a dry seasoned iron skillet) a small handful of dry guajillo chiles and a couple of ancho chilies..Deseed the chilies. Add a about 3/4 cup of chicken stock and puree in blender..I have a Vitamix blender so if it is too thick, add a little more chicken stock..You can add this to your crockpot according to your taste in small amounts and use the rest to add smokiness to your eggs, soups, salsa, cream cheese, or sour cream.. This is similar to how I make my tortilla soup. The difference being I usually sweat/cook the onions a little. I’ve also been known to take some of the soup and blend (in my Ninja) with torn up corn tortillas then return it to the soup, this helps thicken it a little. I hadn’t thought of making it in the crock pot – brilliant! This turned out amazing! Why does the chicken need to be placed on top of chopped veggie mixture? I’m trying to learn how to cook so I was just curious. Love this delicious recipe and so did my grandparents! Thank you! You know…I am not really sure! LOL! I just follow my recipes so that they turn out :) Now you got me curious too! So glad you and your family enjoyed it! Getting excited for soup season! This is perfect for those crazy, busy nights. 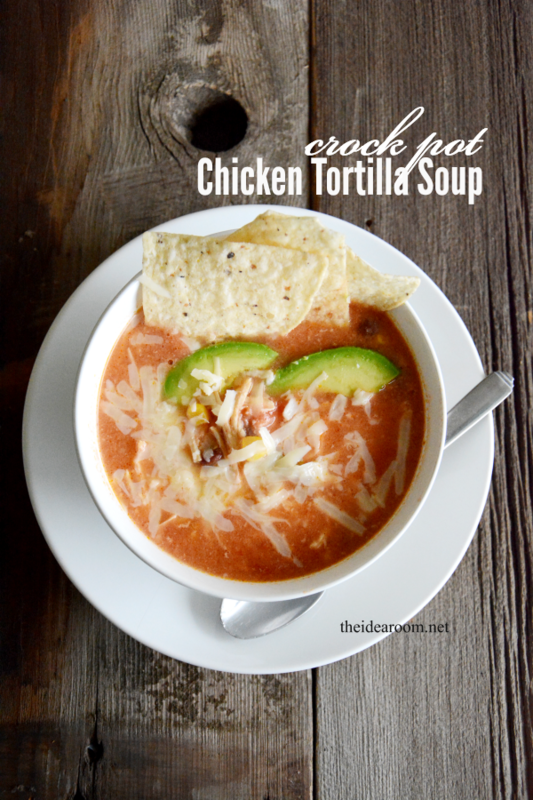 Chicken tortilla soup is one of my favorites, and I love that this one can be made in the crock pot! Heather- Crock Pot Meals are the Best!